If ever a record by a major 1960s artist was a "transitional" album, Phil Ochs’ Pleasures of the Harbor was it. The LP was his first recording to use full band arrangements; his first to almost entirely depart from the topical protest folk songs with which he had made his reputation; his first to be recorded for a then-young A&M label; and his first to be recorded in Los Angeles, the city to which he moved from New York in the late 1960s. It is undoubtedly his most sonically ambitious work, and if the almost ludicrously huge scope of his ambitions guaranteed an uneven album, it nevertheless contained some of his most enduring and successful songs and performances. When Ochs began working on Pleasures of the Harbor in August 1967, he was among the last of the major American folk singer-songwriters of the early-to-mid-1960s who had yet to make the leap from folk to rock. With the exception of a (very good) electric version of "I Ain’t Marchin’ Anymore" on a 1966 single, all of his prior recordings-including three full albums for Elektra-had featured plain acoustic guitar-and-voice arrangements. In fact he had not done any recording at all since the sessions (actually a mixture of live and studio taping) in early 1966 that had been issued as Phil Ochs in Concert. In the interim (and even by early 1966), acoustic folk music had been totally overtaken by the folk-rock of his chief rival Bob Dylan and the likes of the Byrds, Simon & Garfunkel, and the Mamas & the Papas. By the summer of 1967, even folk-rock was passing its peak as the psychedelia of Sgt. Pepper, the Jefferson Airplane’s Surrealistic Pillow, and the Doors’ debut album shook the top of the charts. Ochs continued to write songs at a good clip, but recording-wise sat on the sidelines during these crucial 18 months, in part due to prolonged business machinations that saw him switch both managers and record companies. 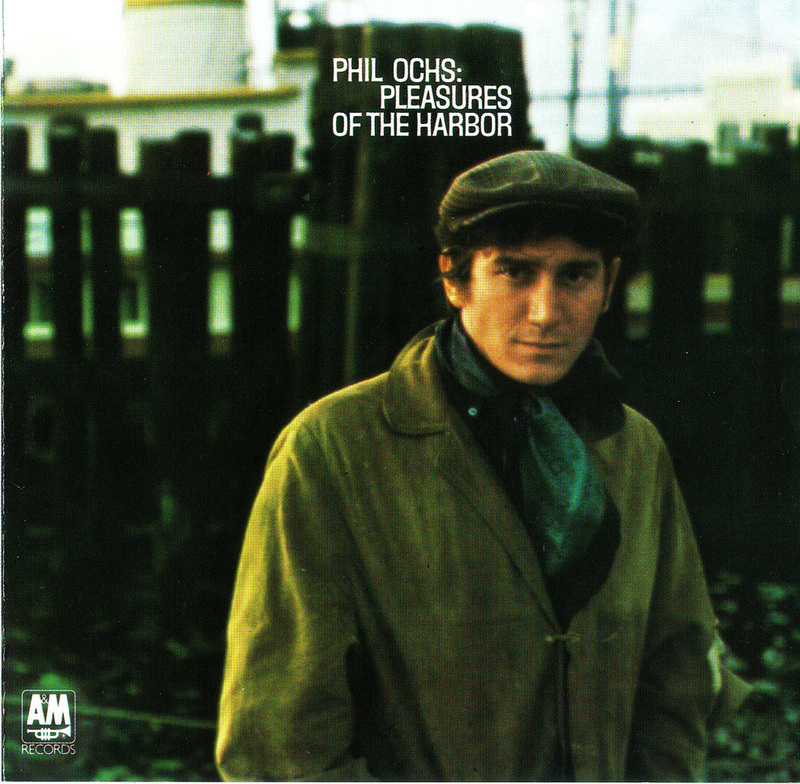 Pleasures of the Harbor may have been the first Ochs album to use electric instruments and elaborate arrangements, but it would not be folk-rock, exactly. Influenced by rock’n’roll, jazz, soundtrack music, classical composition, and even the electronic avant-garde, Ochs sought elaborate, sometimes orchestral settings that would complement the progressively complex poetry of his lyrics. Moreover, he wanted each song to be strikingly different from each other in mood and production, and yet wished the album to flow together well as a whole. Instrumental collaborators in this process would be producer Larry Marks, arranger Ian Freebairn-Smith (responsible for translating Ochs’ countermelodies into finished products utilizing numerous instruments), and pianist Lincoln Mayorga, who gave classical, ragtime, and lounge jazz spices when needed. Baroque pop-rock production-and, perhaps, over-production-was fully in evidence on the opening track, "Cross My Heart," with its drums, harpsichord, flutes, strings, orchestral horns, and vocal overdubs. The song served notice that Ochs was largely abandoning explicit social comment for more abstract statements whose lyrics demanded multiple listenings to absorb all the nuances. Ochs was beginning to write long songs at this point, and in fact Phil might have gotten carried away with "Cross My Heart," as he cut several verses from the number after the album was finished (one of those verses appears on the demo version of the tune on Rhino’s Farewells & Fantasies box set). Nothing in the six minutes of "Flower Lady" was a waste, however, the track-with strings, oboe, and piano-standing as the best of the several pseudo-chamber classical arrangements that Ochs and Marks would attempt in the late 1960s. The moving, just-this-side-of-maudlin composition, with its almost cinematic narrative of a flower lady all but ignored amongst the bustle of numerous contrasting characters, also boasted one of Ochs’ best melodies. Even before Pleasures of the Harbor, cover versions had already appeared by British Invasion stars Peter & Gordon and folk-rock duo Jim & Jean; the Byrds, unfortunately, declined to record it although they had considered doing so. "Outside of a Small Circle of Friends" is perhaps Ochs’ best-known song, and certainly the most celebrated track from his post-acoustic folk recording career. Inspired by the murder of Kitty Genovese in New York, during which several witnesses did nothing to stop the killing for fear of getting involved, it was also Ochs’ most imaginative arrangement. The appalling apathy of idle bystanders doing nothing to stop a woman getting stabbed, and several other similar situations laid out by the subsequent verses, was juxtaposed with a jaunty Dixieland-style backup (with Mayorga on tack piano) and Ochs’ splendidly deadpan vocal. Where most songwriters would have let the statement boil over into self-righteous rage, Ochs shrewdly realized that the message would hit home with a far more chilling punch via understatement and gallows humor. This should have been a hit single, and in fact did become popular in Los Angeles and Seattle. Its chart prospects, however, were scotched by a reference to marijuana. No less than three separate releases of the cut on 45-an unedited one, a version which took out the verse containing the offending word, and another that simply removed the word "marijuana"-were to no avail, as the single failed to break nationally. "I’ve Had Her," a song of bitter romance with a devastating (and heartless) putdown line, had one of the album’s more lugubrious arrangements, highlighting Mayorga’s classical-style piano. It was back to lighthearted Dixieland jazz, however, for "Miranda," one of the few songs from this period of Ochs’ development that could be fairly characterized as fun, though it didn’t dispense with acute narrative detail. Certainly Ochs’ eye for savage yet witty character sketches reached an apex in the eight-minute "The Party," which like "Outside of a Small Circle of Friends" was a perfect match of lyric and arrangement. Ochs took the (singing, not playing) role of the pianist at a party of upper-class snobs, though he didn’t exclude himself from criticism either. Lincoln Mayorga played the role of lounge lizard to the hilt, mimicking the styles of Bach, Beethoven, and Schumann, and purposefully misquoting standards such as "Stardust" to lounge jazz backing. The title cut returned to rich, somewhat overblown orchestration, however, with its bittersweet tales of sailors seeking escape on shore leave, though this was probably a metaphor for escapes of all sorts by everyone, not just sailors. No track in the Phil Ochs canon is more controversial than "Crucifixion," not so much for its lyrics-although those were plenty controversial-as its musique concrete-like arrangement. Its ten verses of martyred heroes couldn’t help but be interpreted as a comment on the still-fresh assassination of President Kennedy. In fact it did bring tears to the soon-to-be-slain Robert Kennedy when Ochs sang it to him. In keeping with the eclectic experimentalism of Pleasures of the Harbor, however, Ochs decided to set his vocal against an eerie morass of loops, electric harpsichord, and washes of electronic distortion, arranged by Joseph Byrd (leader of the excellent late-1960s experimental electronic rock group the United States of America). This made him sound for all the world like a lone voice drowning in an avant-garde thunderstorm, which in the eyes of many fans obscured the terrible beauty of the song as heard when played solo, on acoustic guitar, in concert. The point is now moot as live acoustic versions of the song were eventually released, from 1968 (on There and Now: Live in Vancouver, 1968) and 1970 (on the Chords of Fame anthology and the Farewells & Fantasies box). Pleasures of the Harbor, clocking in at more than 50 minutes, was an outrageously long album for 1967, with most of songs exceeding five minutes and some approaching the ten-minute mark. It was also not terribly successful, peaking at #168 in the charts. While Ochs would not retreat to acoustic folk for his subsequent A&M LPs, and would continue to write songs as unusual (and often lengthy) in construction throughout the rest of the 1960s, he would never again employ textures as recklessly varied as those heard on Pleasures of the Harbor. *Warren Zevon – Guitar On "Pleasures Of The Harbor"
*Joseph Byrd – Arrangements On "The Crucifixion"
Grandioso! Un discazo de grandes arreglos y el punto mas alto de Ochs sin duda!